First, we suggest keeping your area neat and tidy. This eliminates a food source and hiding spaces. Setting humane animal traps might be smart if you've seen evidence of rodents and want to be sure you've nabbed them. You can also take action under the hood of your vehicle. Wire screens can be installed in any openings and around wiring harnesses and hoses to act as a barrier. 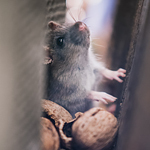 There is another product that may be valuable: rodent-deterrent tape. It's treated with capsaicin, and the spice may be able to send rodents scurrying.